I’ve seen a few company webinars recently. As I have serious problems with their marketing, but don’t wish that to imply a problem with technology, this post will discuss the issues while leaving the companies anonymous. What matters is letting business decision makers separate the hype from what they really need to look at when investigating products. I’m in marketing and would never deny its importance, but there’s a fine line between good marketing and misrepresentation, and that line is both subjective and fuzzy. As I discussed in more detail in a TechTarget article, BI vendors regularly claim self-service when software isn’t. While advances in technology and user interface design are rapidly approaching full self-service for business analysts, the term is usually directed at business users. That’s just not true. I’ve seen a couple of recent presentations that have that message strewn throughout the webinars, but the demonstrations show anything but that capability. The linking of data still requires more expertise that the typical business user needs. Even worse, some vendors limit things further. The analysts still create basic reports and templates, within which business people can wander with a bit of freedom. Though self-service is claimed, I don’t consider that to approach self-service. The result is that some companies provide a limited self-service within the specified data set, a self-service that strongly limits discovery. As mentioned, that self-service is either misunderstood or over promised doesn’t obviate that the technology still allows customers to gain far more insight than they could even five years ago. The key is to take the promises with a grain of salt. Prospective BI buyers need to focus on whether or not the current state of the art presents enough advantages over existing corporate methodologies to provide proper ROI. That means you should evaluate vendors based on specific improvements on your existing analytics and the products should be rigorously tested against your own needs and your team’s expertise. Machine learning, to be discussed shortly, has exploded in usage throughout the software industry. What I recently saw, from one BI vendor, was a fun little marketing ploy to leverage that without lying. That combination is the heart of marketing and, IMO, differs from the nonsense about self-service. Throughout the webinar, the presenter referred to the platform as “the machine.” Well, true. Babbage’s machines were analytic engines, the precursors to our computers, so complex software can reasonable be viewed as a machine. The usage brings to mind the concept of machine learning while clearly claiming it’s not. That’s the difference, self-service states something the products aren’t while machine might vaguely bring to mind machine learning but does not directly imply that. I am both amused and impressed by that usage. Bravo! This phrase needs a larger article, one I’m working on, but I would be remiss to not mention it here. The two previous sections do imply how machine learning could solve the self-service problem. First, what’s machine learning? No, it’s not complex analytics. Expert systems (ES) are a segment of artificial intelligence focused on machines which can learn new things. Current analytics can use very complex algorithms, but they just drive user insight rather than provide their own. Machine learning is the ability for the program to learn new things and to even add code that changes algorithms and data as it learns. A question to an expert system has one answer the first time, and a different answer as it learns from the mistakes in the first response. Natural Language Processing (NLP) is more obvious. It’s the evolving understanding of how we speak, type and communicate using language. The advances have meant an improved ability for software to responds to people without clicking on lots of parameters to set search. The goal is to allow people to type or speak queries and for the ES to then respond with information at the business level. The hope I have is that the blend will allow IT to set up systems that can learn the data structures in a company and basic queries that might be asked. That will then allow business users to ask questions in a non-technical manner and receive information in return. Today, business analysts have to directly set up dashboards, templates and other tools that are directly used by business, often requiring too much technical knowledge. When a business person has a new idea, it has to go back to a slow cycle where the analyst has to hook in more data, at new templates and more. When the business analyst can focus on teaching the ES where data is, what data is and the basics of business analysis, the ES can focus on providing a more adaptable and non-technical interface to the business community. Machine learning, i.e. expert systems, and NLP are what will lead to truly self-service business applications. They’re not here yet, but they are on the horizon. This entry was posted in Business Intelligence, Marketing and tagged bi, business intelligence, machine learning, self-service, teich communications on June 20, 2017 by David Teich. There were three presenters: Brian Bulkowski, CTO and Co-founder, Aerospike; Kevin Petrie, Senior Director and Technology Evangelist, Attunity; Reiner Kappenberger, Global Product Management, HPE Security – Data Security. Brian was first at the podium. Aerospike is a company providing what they claim is a very high speed, scalable database, proudly advertising “NoSQL!” The problem they have is that they are one of many companies still confused about the difference between databases and SQL. A database is not the access method. What they’re really focused on in loosely structured data, the same way Hadoop and other newer databases are aimed. That doesn’t obviate the need to communicate via SQL. 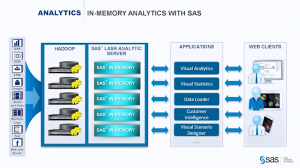 He also said that the operational in-memory market is “owned by NoSQL.” However, there were no numbers. Standard RDBMS’s, columnar and NoSQL databases all are providing in-memory storage and processing. In fact, Information Management has a slide show of Gartner’s database analytics vendor report and you can see the breadth there. In addition, what I constantly hear (not statistically significant either…) is that Hadoop and other loosely-structured databases are still primarily for batch. However, as the slide show I just mentioned is in alphabetical order, and Aerospike is the first one you’ll see. Note again that I’m pointing out flaws in the marketing message, not the products. They could have a great in-memory solution, but that’s doesn’t mean NoSQL is the only NoSQL option. The final key marketing issue is that he kept misusing “transactional.” He continued to talk about RDMS’s as transactional systems even while he talked about the power of Aerospike for better handling the transactions. In the later portion of his presentation, he was trying to say that RDBMS’s still had a place, but he was using the wrong term. Attunity’s Kevin Petrie was second and his focus was on Attunity Replicate. The team of Aerospike and Attunity again shows the market isn’t yet mature enough to have ETL and databases come smoothly together. Kevin talked about their 35 sources and it seem that they are the front end in the marketing paring of the two companies. If you really need heterogeneous data sources and large database manipulation, you’ll need to look at the pair of companies. My key issue with this section was one of enterprise priorities. Perhaps the one big, anonymous reference they both discussed drove the webinar, but it shouldn’t have owned the message. Mr. Petrie spent almost all his time talking about Hadoop, MongoDB and Kafka. Those are still bleeding edge tools while enterprise adoption requires a focus on integrating with standard and existing sources. Only at the end, his third anonymous case, did Kevin have a slide that mentioned RDBMS sources. If he wants to keep talking with people running experimental and leading edge tests of systems, that priority makes sense. If he wishes to talk to the larger enterprise market, he needs to turn things around. The other issue was a slide that equated RDBMS, Data Warehouse and Hadoop as being on equal footing. There he shows a lack of business knowledge. The EDW, as an old TV would declare, is the one of these things that is not like the other. It has a very different purpose from the two database technologies and isn’t technology dependent. Reiner Kappenberger gave a great presentation but it didn’t belong. It seems the smaller two firms were happy to get HP to help with the financing but they didn’t think about staying on message. Let me make it very clear: Security is of critical importance. What Mr. Kappenberger had to say was very important for people to hear. However, it didn’t belong in this webinar. The topic didn’t fit and working to stuff three presenters into forty minutes is always tough. Another presentation where all three talked about how they work to ensure that the large volumes of data can be secure at multiple levels would have been great to hear – and I hope the three choose to create such a webinar. This was two different webinars stuffed into one, blurring the message. In addition, Aerospike and Affinity either need to make sure they they’re not yet trying to address the mass market or they need to learn how to stop speaking to each other and other leading edge people and begin to better address the wider enterprise market. The unnamed reference seemed to be a company that needed help with credit card transactions and fraud detection, and all three companies worked to provide a full solution. However, from a marketing standpoint I don’t think they did proper service to their project by this webinar. This entry was posted in big data, Business Intelligence, Enterprise Software, Marketing and tagged aerospike, attunity, bi, big data, business intelligence, data warehouse, hp, nosql, rdbms, teich communications on April 11, 2016 by David Teich. My latest article can be found here: http://searchbusinessanalytics.techtarget.com/feature/Business-intelligence-in-the-cloud-gives-boost-to-BI-process. This entry was posted in big data, Business Intelligence, Enterprise Software, Marketing and tagged bi, big data, business intelligence, cloud, cloud computing, techtarget on July 10, 2015 by David Teich. TechTarget took previously published article about self-service BI, bundled it with some other articles and reprinted it. This entry was posted in Business Intelligence, Enterprise Software and tagged bi, business intelligence, techtarget, teich communications on March 31, 2015 by David Teich.